Minus the mooning, that is just REALLY cool. I'd be happy if someone came on the porch and ate the carved pumpkins. As long as they did it after Halloween. Now you don't have to worry about disposing of your pumpkins. There's a moose on your deck! I was just at Wal-mart and they had pumpkins on sale for 50 cents a piece. I wondered who would buy a pumpkin now for any price. 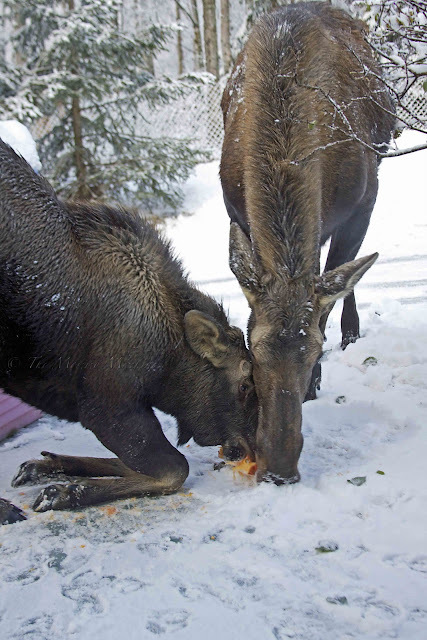 I suppose it would do for moose food! I will not complain about the deer eating a few flowers again. Ok, I will, but I'll think about your poor pumpkins. Wow right in your backyard? I've had deer in my backyard, but never moose. That's pretty awesome. Ah, the moose are back. What is it with you and your close encounters with wildlife? 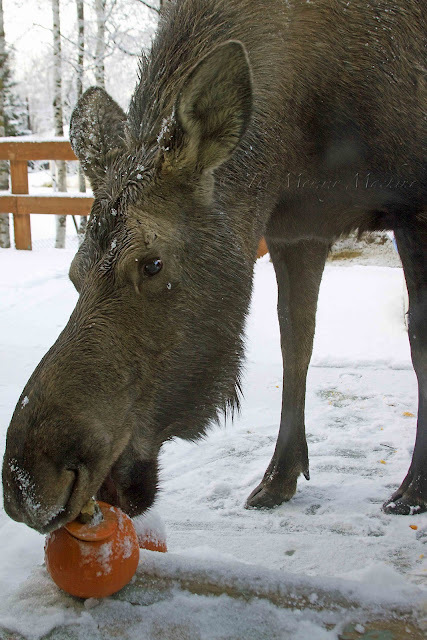 Kim, I love the moose eating the pumpkin. Here it's squirrels who do that. Guess what, it takes them a lot longer. Well that was sure not a pretty site to see through your window. That is awesome. That is one view I never see from my windows. Love this picture! I have to say the moose, meese(?) in your area looking like super cute characters!